In case you hadn’t heard, brunch is kinda hot right right now — and hosting your own is super fun, but also a little tricky. I mean, you want it to be delicious and Instagram-worthy, right? Enter the yogurt bar. It’s healthy, easy and it looks pretty dang cool. 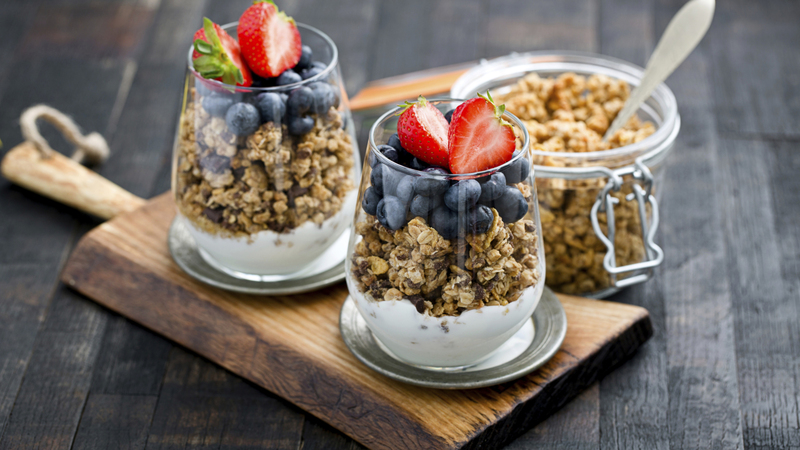 A yogurt bar is clutch for brunch or any party setting because it allows your guests to customize their parfait — and they get to keep mingling while they do it. Here’s exactly how to build your own perfect yogurt bar. The next step is to create a sign to hang over your yogurt bar. We love this spring mantel sign, and you can easily adjust it to say “Yogurt Bar” instead of “Spring.” Once the sign is complete, you’ll need to make labels so your guests know which topping is which. Make sure to include whether or not the topping has nuts or any other possible allergens. You can create vintage labels on cardstock, or simply handwrite the items on note cards. We also suggest making homemade whipped cream so guests can dollop a bit on top of their creations. To make, simply beat 2 cups of whipping cream on medium speed until peaks form, then add a few big spoonfuls of powdered sugar and a tablespoon of vanilla. Mix again until well blended. Refrigerate until ready to serve. About one hour before the party, place any dry, nonrefrigerated items in proper bowls, and place the correct label in front of each. Set up all serving utensils on the table, and hang up your sign. About 30 minutes prior to guests arriving, slice all the fresh fruits, and place them in bowls, followed by placing the yogurt in proper serving bowls. We recommend keeping these items refrigerated until the guests will be eating. Finally, make yourself a parfait, and enjoy!